If you’re planning on ordering a dress, get it ordered no later than 9 months before the wedding as you may have to make adjustments when it arrives. In regard to a photographer, make sure you book in early as you want to ensure that your precious moments are captured by a talented professional. So make sure that when deciding on a photographer or videographer that you see a lot of examples of their work. Same situation when booking a band or DJ, book them way in advance so if there are any issues or conflicting events, you have time to find someone else. It will also benefit you to book your officiant, florist and caterer (if needed) 9 months prior to be safe. You’d better start looking to hire an officiant that you would feel comfortable to be a part of your wedding. You could get a stranger, a friend or a referral to someone who is ready, qualified and experienced in creating the perfect wedding environment you would be looking for on your big day. Now is the time to decide what your bridesmaids will be wearing, are you wanting them in solid colours or prints? Are you wanting the bridesmaids in the same style of dress or convertible bridesmaid dresses? Make sure you order with plenty of time for alterations. Then you’ve got to think about your stationary order. The first hint the guests will have towards your wedding style is from your invitations. If the invitations are discordant, you might accidentally prepare your wedding guests to dress inappropriately. Also, if you are looking to use a calligrapher, then now would be the time to book their services. Lastly, if you don’t want your wedding to be flawed with miss-match flowers then you better get onto a florist now. 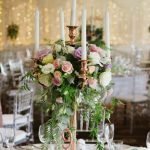 Naturally you’ll want a bouquet and centerpieces, but are you also looking to include flowers, lighting and décor as a part of your wedding? Choose flowers that are in season, or if they’re a part of your ‘dream wedding’ choose the date around that because you aren’t going to get winter flowers in summer. Time is flying by and hair and make-up stylists are usually booked months ahead. Make sure you schedule hair appointments for three hours before and make-up appointments at least an hour before the ceremony. You want to be able to have choices without running late and keeping people waiting. Now that your dresses are ordered, you will need a few extra appointments to make sure that yours, and the bridal parties dresses all fit like a glove. Make sure you get onto it quick so there is plenty of time for alterations and there are no ‘bridezilla’ panic moments on the day. Not all weddings need to involve a five-course dinner and dancing before cake. Your wedding could be a brunch, lunch or an intimate family style gathering. Make sure you are prepared with enough time to change little things in case of allergies and intolerances, yet can be loved by all. Also, sit down with your partner and choose music that reflects you two as a couple, work with other aspects of the wedding and connote a celebration. Order your cake, discuss music options and decide on the food in these months. Don’t forget the little things! Make sure you mail your invitations with adequate time for your guests to respond, leading to a reliable head count. Start booking rental gear that will help your wedding environment stand out, tents, chairs, tables etc. Personalise the ceremony with colours, music and expected moods for each part or the ceremony. Have your wedding rings been bought? Get onto them now before you forget. Make sure you have plenty of time to size their finger right and have plenty of choice for the perfect wedding band. Go buy those shoes you have had in your mind from the moment they proposed. Because you need to break them in. There is nothing worse than walking around on your special day in agony because your shoes are brand new. Find days at home, around the office or anywhere where you can soften those bad boys up for your own benefit. You will need to think about and plan the little things. Sort out your seating plan, choose who will be doing toasts and print out your programs. Make sure you research your state laws and secure your marriage license before the big day. Confirm your band/DJ, the decorator of the reception and the transportation if necessary. Do a final head count, and start packing! Lastly, confirm the style and length with your partner and get onto writing your vows! There shouldn’t be much left to do other than to take care of yourself. Make sure you remember to hydrate and eat. No one wants to see you collapse on your big day. Hydrating will also help when the alcohol starts to flow and you dread being escorted out of your own wedding. Charge your phone for maximum photo opportunity. You will be guaranteed a million photos with each wedding guest and you’ll need plenty of battery for that. It will also allow you to stay in touch with people who might need help finding the venue etc. and keep updated with weather activities. Your monumental day will go by so fast, so don’t rush, take care and stay in the moment. Soak in every experience and enjoy yourself. Stay close to your spouse to create memories together. Remember the little things, dance harder than ever before and don’t forget to smile. If you need any help planning your big day, contact Waterside Events today – we will be thrilled to be a part of it!